To help our gamers play as Paint Protector easy, we conclude some tips for Paint Protector. Hope it works. Paint Protectors’ guide is to protect the rim against your center, and to protect the rim on people driving to the lane. Its role is to make sure that no one scores in that paint but if you guard a stretch big it will be hard guarding the paint but that’s what you have to do basically. 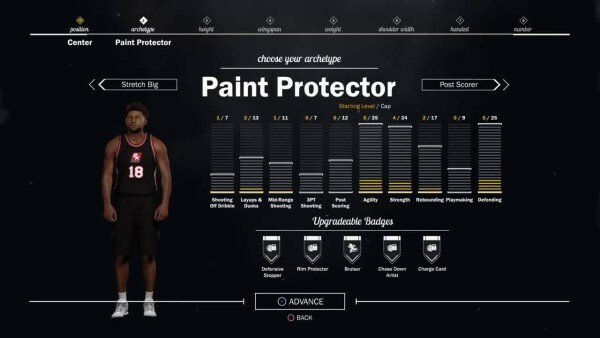 If there is an archetype that can stop the Slasher, the Paint Protector is this archetype. 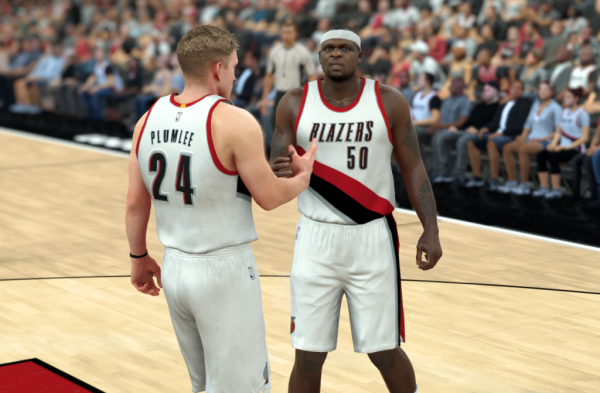 Also on screens your defensive capabilities allow you to do a passable job guarding guards momentarily. Extremely inferior offensively to other centers, even with defensive stopper you can still be posterized by a glass cleaner for example. If you play mostly MyPark solo I would recommend a smaller player. Most of the bigs are stretch bigs and most of the time you will be up against some combination of PG/SG/SF. I find mobility to be at a premium, to cover smaller players and to give you the range to cover the paint and a stretch big. Or you can max agility and defense first, as those are related to your primary job. After that grab rebounding and strength. For offense go either with post scoring or dunks, but you will likely spend most of your time on offense setting screens. Think DeAndre Jordan or Ben Wallace, your job offensively is to help the other players from off the ball or find ways to get open near the rim. We recommend getting a team to play with because if you play with randys man to man and you get a stretch, there’s a good chance paint is gonna be open the entire game so find a team of 3 and just play zone. If you have a group to play with, just play zone and stay near the rim to stop drives and get rebounds, and do whatever fits best into your group’s offensive scheme. If you are playing Pro-Am, we would give you some suggestions and notices. In Pro-Am, remember that just because you have 94 block, it doesn’t mean you should jump on all shots at the rim. 9/10 times just standing there will cause a miss, learn the animations and angles to the point where you know which archetypes + what combination of animations you have to jump and swat/contest, and all of the other ones where you get immediately ready for the board by inputting nothing. Hope this article would help you. If you have other suggestions, share with us. Have you heard about an update of NBA 2K17? According to it’s Twitter account, NBA 2K17 will release fixed bugs and issues of NBA 2K17 in its new update. So, if you are looking for how to update NBA 2K17, here we provide you the way to do it. Well, these are the basic steps on how to update NBA 2K17. Some of the major fixes that come along in the updates include the fixes of hang that occurred in the game and a score that wouldn’t’ update after a made basket. Likewise, the game also has fixed issues in sections like MyPark/2K Pro-AM, MyCAREER / MyCourt. The Gameplay extreme hang issue that occurs when a player attempts to grab rebound is solved with the new update. The update was first introduced on PlayStation 4, and then to PC and Xbox One. It is said, the fixes will work in existing game mode saves. As the official announced, the newest patch will focus on some issues of the Pro-Am feature along with roster update problems.